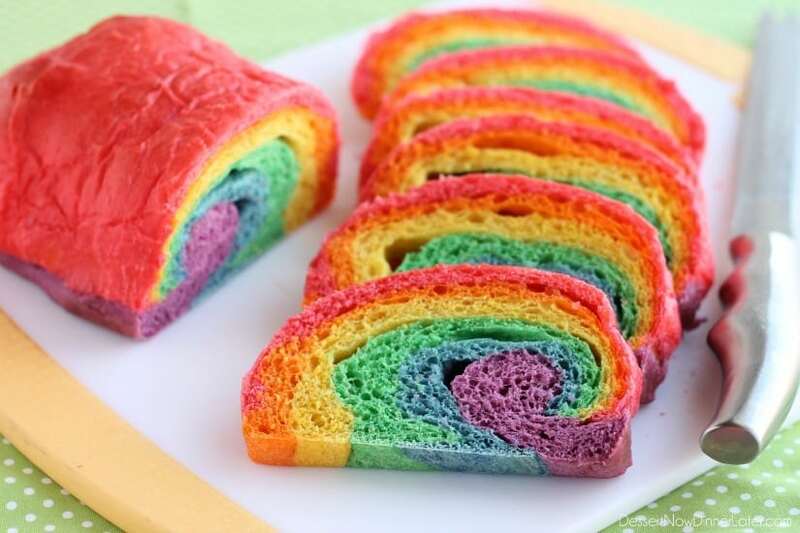 Rainbow Bread - Dessert Now, Dinner Later! Rhodes frozen dough is kneaded into 6 bright colors and rolled into a fun rainbow loaf. The perfect bread to eat with butter for dinner or use for breakfast French toast on St. Patrick’s Day! Oh my goodness! 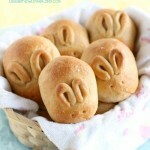 Today’s recipe is so cute, I have been dying to share it with you! This Rainbow Bread starts with frozen dough, so you don’t have to stress about getting it to rise, and all you need besides that is food coloring and your two hands! This bread is so pretty, and totally worth making for St. Patrick’s Day. Serve it with butter for dinner or make French toast with it for breakfast. Your kids are going to think you are the coolest mom on the planet! It sure was fun to see my kids’ faces when they saw the final loaf all finished! They couldn’t wait to eat it! I think the only thing better than the colorful bread would have been if it had tasted like skittles or something, haha. This bread is slightly time consuming to knead in all the colors, so make it the day before St. Patrick’s Day and you are golden! Head over to the Rhodes blog for all the details where I show you how it’s done! Cut each loaf into thirds, so you have 6 pieces. If you have plastic gloves, use them to help protect your hands from turning colors. I kneaded each section of dough with my bare hands on a silicone mat to protect my counter and I used baking spray to keep my hands from sticking to the dough. Washing your hands between colors helps, and a little bit of watered down bleach will help get most of the coloring off your hands when you are done. Keep the extra pieces covered while you work so they don’t dry out. I find it easiest to roll each piece of dough into a rope, then fold the rope ends in towards the center creating a round shape, then dab the dough all over with food coloring. 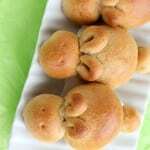 Fold the food coloring inside the dough, and then roll it back into a rope. Repeat until you reach a bright, solid color. It took me about 10 MINUTES TO KNEAD EACH COLOR (1 hour total). You will get a workout! 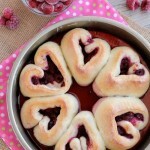 For a photo tutorial, visit the Rhodes Bake-N-Serv Blog. Once all of the colors have been made and the dough has rested for at least 10 minutes, roll each color into a rectangle, starting with the red, then orange, then yellow, then green, then blue, then purple. Cut the large rectangle in half, and roll each half into a loaf so the red layer is on the outside. Place each loaf into a greased loaf pan. COVER AND LET RISE 1 HOUR or until double in size. Bake at 350 degrees Fahrenheit for 25 to 30 minutes or until baked through. Flip bread out onto a cooling rack and allow the bread to cool completely before slicing. 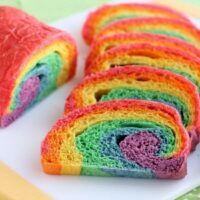 Serve this rainbow bread with butter for dinner, or use it for a colorful French toast breakfast! Enjoy! It’s so pretty, Amber! I love that you used Rhode’s frozen dough to make this. Rhodes bread is so fun to play with, obviously! Haha. I felt like a kid with playdough for this post! This bread is stunning, Amber! The rainbow colors are so fun and I love that you used Rhodes dough! The colors are so bright and beautiful! Thanks Kelly! It was a little time consuming, (I kneaded in the colors all by myself) but the results were so fun! Oh my gosh I used to buy a rainbow braided bread as a kid and everyone thought I was nuts, but it’s so fun! Ooh! Braiding it would be fun too! I have to try this, they used to have it at a supermarket where I used to live, but now I need to make it myself! You should totally be a Rhodes blogger! I spoke too soon! Just clicked your link and saw where it went. You’re perfect for it! Thanks Michelle! I love being a Rhodes blogger, and this bread was fun to make! 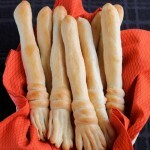 This bread is absolutely genius, Amber! It seriously does look like a rainbow—too fun! Isn’t it fun?! Thanks Sarah! 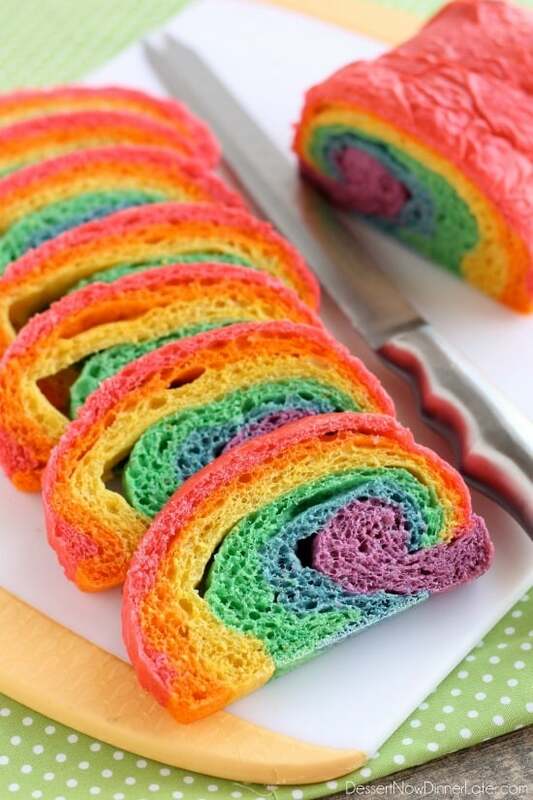 I’m loving all your rainbow baking… this is so cute!! What a great easy idea! Thanks Jess! 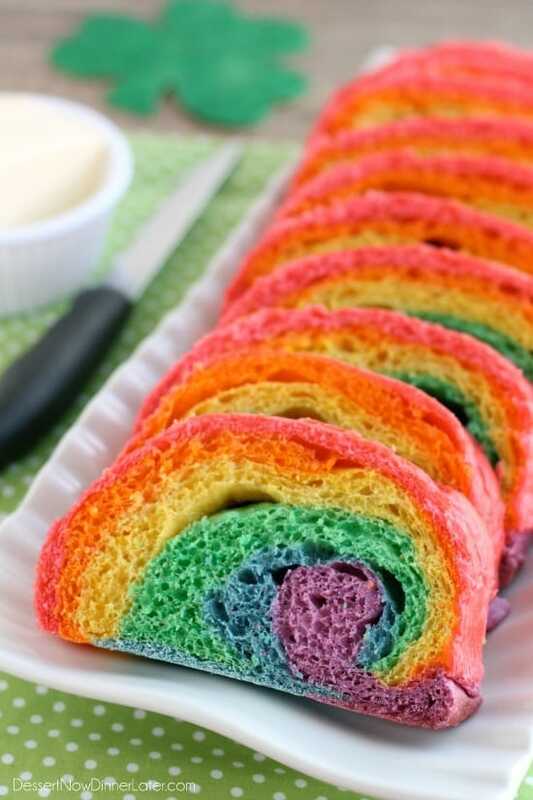 I’m kind of obsessed with rainbows right now, and my kids especially liked this bread!